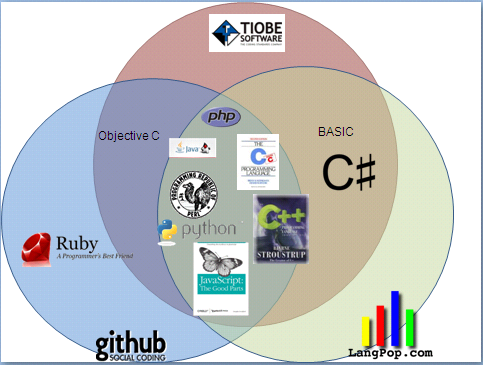 There are several programming languages popularity index, the more “famous” is probably the TIOBE Programming Community index which is mostly based on search results, there are also other like langpop.com (also search based) and Github which looks at kind of code is being checked in. What happens when we put the results of these together. I took the top 10 languages and this is what i get. Lets take a look at only the Top 5 from each index. This is what we get. The reason for more entries for GitHub is because for PHP and C they share the same percentage of use. All the languages that are in the Top 10 all tend have a rich set of libraries and frameworks. The popularity of Java could be tied to the fact that most enterprises used it. PHP is perhaps the most popular web programming language out there with great frameworks, easy deployment, Wikipedia, Facebook all uses it. Most of the services provided by Google, yahoo all have some form of a PHP library. Well for C and C++, i guess would be games, kernal programming. C# is perhaps the only language that is tied to a specific OS in all the languages featured here, yes I know about Mono but Microsoft .Net provides some much more than what Mono provides for Linux. The GitHub data is interesting though since I am guessing that most of the projects there are stuff that people do outside of their regular jobs, that’s why we are seeing dynamic languages on that side of the sphere since they have lower overheads in programming, most have a edit and run compare to a edit, compile, build, run kind of programming cycle. So they are great for trying stuff out. 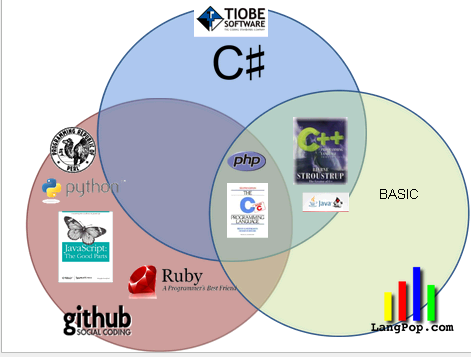 I see the data as representative of my own personal work, at work I mainly use Java, C# but in my own personal projects, I use Python and PHP. What about you guys, Are these languages in your skill set? What do you think of the results? Any other indexes that I should compare? I am going to do this one year later and see how much the data has changed. Perhaps we will see the rise of functional languages?